In rare public remarks, Acting Attorney General Matthew Whitaker spoke at an event celebrating religious freedom Wednesday. Whitaker delivered the keynote address on "The Religious Freedom Restoration Act At 25: How It Fosters Peaceful Pluralism," held at the Heritage Foundation to celebrate 25 years since the act was passed. Whitaker noted that the Religious Freedom Restoration Act (RFRA) had passed the House unanimously and the Senate by a 97-3 vote. Then-Rep. Chuck Schumer (D., N.Y.), now the Senate minority leader, was the one to offer the bill in the House. The 1993 federal law provides protections from federal coercion to Americans seeking to sincerely practice their faith. "Religious freedom has made this country stronger," Whitaker said. He noted that its beneficiaries, those practicing their faiths through their actions, feed the hungry and assist with the humanitarian crisis on the southern border. "Threats to our religious freedom are threats to our national strength as well," Whitaker said, pointing to measures the Trump administration had taken to strengthen it. In July 2018, then-Attorney General Jeff Sessions directed the Religious Liberty Task Force to ensure the Department of Justice and the broader federal government were providing religious protections consistent with RFRA. In remarks to the Boston Lawyers Chapter of the Federalist Society in October 2018, which began with interruptions from protesters, Sessions said the Religious Liberty Task Force would lead the effort to prevent the government from practicing religious discrimination. The Task Force would determine "whether there are other instances in which this kind of discrimination is occurring at the federal level," Sessions said. "If so, it must, and will, stop." The federal government, Whitaker said, would give Americans more breathing room to exercise their faith, without first having the government interfere and only then being granted reprieve by the courts. "Not everything needs to be decided by a judge," Whitaker remarked before joking about some of his personal experiences with those wearing the black robe. "RFRA promotes authentic tolerance," he said, arguing that religious protections ensure that "good citizenship is open to every American." Whitaker closed with a prayer that in another 25 years, religious freedom will remain as important as it was when the Virginia state legislature first protected it in 1786. 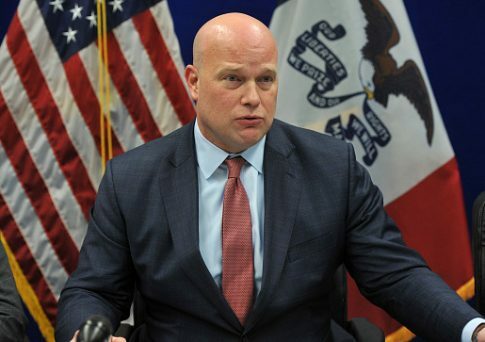 Earlier in his remarks, Whitaker also took the opportunity to praise William Barr, President Donald Trump's nominee for attorney general, who on Wednesday answered questions before the Senate for the second day. Trump nominated Barr in December 2018 to replace Sessions after he resigned the month prior. Barr, who previously served as attorney general in the George H.W. Bush administration, spent several hours fielding questions from the Senate Judiciary Committee Tuesday, including from several likely 2020 Democratic candidates for president. Whitaker praised Barr's performance, calling him the "right person" for the job and saying he performed "exceptionally well" through his first hearing. Following Whitaker's remarks, Emilie Kao, director of the Richard and Helen DeVos Center for Religion & Civil Society at The Heritage Foundation, led a discussion on the present state of religious freedom in the United States. Kao expressed disappointment at the loss of consensus on religion freedom. The landmark decision had been supported by a 66-organization "Coalition for the Free Exercise of Religion," which included the American Civil Liberties Union and the American Humanist Association. Today, however, many organizations have argued religious freedom has been used as a right-wing tool for discrimination. Kao was joined by Howard Slugh, Asma Uddin and Gregory Baylor, all attorneys active in legal issues pertaining to religious liberty. Slugh, the founder and general counsel for the Jewish Coalition for Religious Liberty, explained that RFRA was never a tool for a religious majority to exercise its power. Rather, it was a tool designed for—and, on the whole, used by—religious minorities. He explained the RFRA had been a historic achievement by both political parties, and proof that "Americans prefer compromise over coercion." He noted the RFRA is the "first line of defense" for practices like kosher slaughter and circumcision, a practice already restricted in parts of Europe. Lest that seem a purely European problem, Slugh noted the circumcision ban had recently been raised by San Francisco city legislators. In Washington State, which has no RFRA equivalent for state laws, residents have no protection against generally applicable laws that impede the free exercise of religion. Slugh pushed back against the claim that RFRA was being misused by religious Americans, arguing it was the courts that had been incorrectly reading the law. Where RFRA has been used in "new ways," Slugh noted it was only because of "unprecedented government coercion" against Americans of faith. Where RFRA demanded that no law "shall substantially burden a person's exercise of religion," courts had interpreted it to mean that a significant part of the person's faith had been burdened. In fact, Slugh argued, the law meant that the burden imposed by the government was severe, however small the article of faith affected. The law meant "substantial burden from government, not substantial burden from God," he said to laughs from those in attendance. Asma Uddin, an attorney at the pro-religion nonprofit Becket Fund, described how important the law was to Muslim Americans. After the Supreme Court ruled in Burwell v. Hobby Lobby Stores, Inc. that, pursuant to RFRA, "closely held" companies could appeal to religious grounds for partial exemptions from regulations. Uddin noted that such cases were fairly rare. Per one study, only 0.6 percent of cases on the federal docket, such as Holt v. Hobbs, dealt with questions of religious freedom. In Holt v. Hobbs, a Muslim prisoner argued that an Arkansas prison's restriction on facial hair violated the Religious Land Use and Institutionalized Persons Act. Uddin warned that, for all the challenges to RFRA from the left, there were some "worrisome trends from the right" as well. Some courts had taken up the argument that Islam was not a faith but a political system, and therefore not entitled to RFRA protections. She rejected that argument, and urged supporters of religious liberty to be unremitting in their universal defense of religious practice. Herself a Muslim, Uddin argued that "we have to protect the right to be wrong." Gregory Baylor, senior counsel with Alliance Defending Freedom, warned that threats to RFRA can come from all three branches of the federal government. He praised the Trump administration for having "been an outlier in its respect for RFRA." He warned that there was no guarantee a future administration would so robustly comply with RFRA. "Religious liberty used to be a unifying phrase," he said. He described the issue as polarized today, but noted that the two sides were far from equal. "People of faith are mostly arrayed on one side of this battle," he said. He called for Americans of all religions to remain unified on this issue, whatever their other disagreements. This entry was posted in Issues and tagged Department of Justice, Religious Freedom. Bookmark the permalink.